Presenting four colors from Pantone's Fashion Color Report Fall 2013: Mykonos Blue, Linden Green, Vivacious and Samba. A fresh and modern palette can be instantly created when mixing the blue, green and pink. It will give a sense of softness from the Mykonos Blue and Linden Green and a statement from Vivacious. Now, to take it to the next level, we suggest adding a pop of an unexpected color: Samba's ultra rich hue will make this outfit definitely stand out. Learn more outfit techniques here. 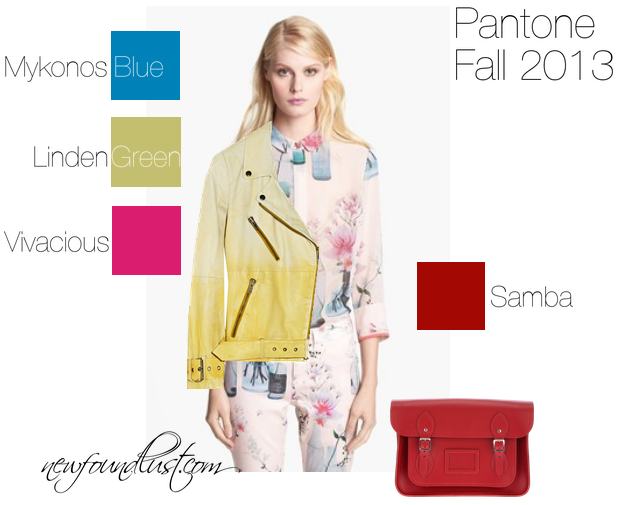 Beige Watercolor Bottles Print Shirt and Jeans by Ted Baker; Evan Dãgradã Leather Biker Jacket by W118 by Walter Baker; Raw Cut Satchel by The Cambridge Satchel Company.